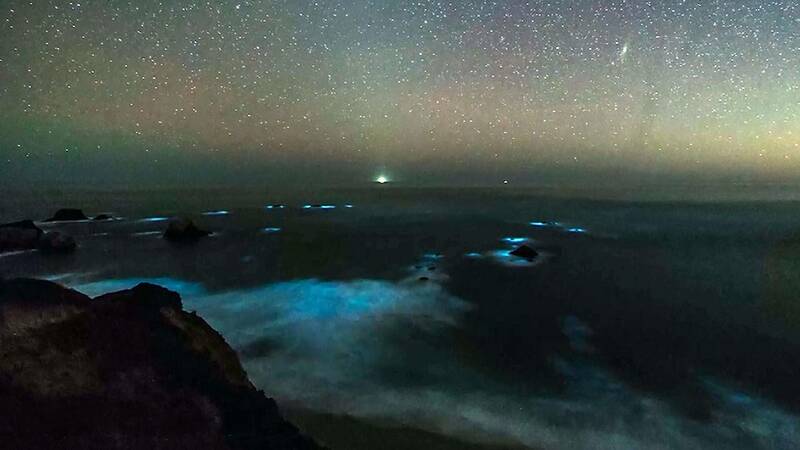 (CNN) - Big Sur is home to some of the most breathtaking views in the US, but a recent bloom in bioluminescent phytoplankton has turned its waves into a full-blown spectacle. The bright blue water under California's Bixby Creek Bridge comes alive in photographs taken on Monday night by Monterey photographer George Krieger. Combined with a star-speckled sky, the entire scene lights up the night. So what's causing the unusual sight? "It is almost certainly a dinoflagellate bloom. We are also seeing relative high bioluminescence with our instruments here in Monterey Bay," Steve Haddock, a bioluminescence specialist at the Monterey Bay Aquarium Research Institute, told CNN affiliate KSBW. "The species counts from [the] Santa Cruz area show low to moderate numbers of the 'usual suspects' of luminous species that we would expect to cause such a bloom: Noctiluca, Lingulodinium, and Protoperidinium being some of the brightest," he said. Reports of glowing waves down the California coast have spiked since early January, most likely due to a combination of high nutrient rates and calm conditions that form layers of highly concentrated dinoflagellates in the water, Haddock explains. Once the wind picks back up, the phytoplankton will likely be dispersed through the waves. In the meantime, tourists and locals are in for a special treat after sunset.